Our story begins with a flashback to Watchmen, as Ozymandias murders the Comedian, but unlike Watchmen, The Comedian doesn't land on the street, as he's thrown out the window, now he ends up in the bay area of what looks like Metropolis. He is greeted by Doctor Manhattan, and is given his familiar smiley face button. We then cut to the present as The Comedian fights with Ozymandias, continuing from the last issue. Ozymandias sees that he may not be able to win, he decides to flee by jumping out the window, toward the opposing building, landing on a window washing scaffold, only for it to break, and he crash to the ground. Meanwhile in the Batcave, Batman and Rorschach discuss why he is there. Rorschach gives him the journal of his predecessor, and is then told by Batman to go find a room upstairs have a shower and get some rest, while he reads the journal to find out where Dr Manhattan may be. Meanwhile at a retirement home, an old Johnny Thunder anxiously awaits a visit from his family (Granddaughter and her son). The Mime and Marionette make their way into a bar, wearing their costumes, and are opposed by its clientele, who happen to be members of The Joker's gang. I fight breaks out, and it appears that The Mime truly does have invisible weapons in his arsenal. Rorschach (Reggie) is awoken by a nightmare, which seem to be of the events that occurred at the end of Watchmen, he then discovers Bruce Wayne in the room. Bruce tells him that he thinks he knows where Dr Manhattan is, and he and Rorschach head to Arkham Asylum. The two sneak in, and Batman leads him into a cell, telling him that Dr Manhattan is in there. He then closes the cell door behind him and tells him "I'm Sorry... but you belong in here" and walks away. We close with an angry and hysterical Rorschach screaming, "LET ME OUT". Story - 5: Firstly I must apologize, last month I wrote in my review "Curious to see why Ozymandias is having headaches in such a way, my first inclination is that he may have become 'ill' due to his close contact with Dr Manhattan in the past". At the time I started writing the review, I had let slip that in issue #1, it was established that he has a tumor. I must have forgotten to take that statement out as I proofread, before sending to Steve to post on the site. So far Johns is doing a wonderful job of capturing the tone and the voice of the Watchmen characters. I liked the parallels that Johns made with Ozymandias escape and The Comedian's fall to his death in the original series. I especially liked the small detail of Ozymandias slipping on the pool of Lex Luthor's blood. That is one thing that I must give praise to Johns about, the very detailed and methodical way that he is writing series, it not only makes you think twice about each page, but also rivals the original series in the amount of thought that is put into each panel of each page. Though this issue seemed to drag on a bit, and even hinted at being a little boring in the pacing, I had to keep reminding myself that this really isn't meant to be read as an individual monthly series, but rather as a collected whole. It is the writing style of the industry at the moment as it is, but it can get a tad frustrating as you wait an entire month to read the next chapter. I blame Netflix. Dr Manhattan is indeed responsible for the return of The Comedian, and we already know that he has been manipulating events behind the scenes, so will be interesting to see what or rather who else he has brought over from his world. My only concern is, that I hope that by the end of this series, the Watchmen characters don't become mainstays of Earth 0 (the main DCU). Batman's interactions with Rorschach seemed a little off at first to me, I couldn't imagine him being so nice to someone that had broken into the Batcave and discovered his secret identity. As usual, Johns was able to bring the character right back to his roots as he deceives Rorschach and has him committed. Really curious as to what Rorschach may do, once he escapes and is confronted by Batman once again in future issues. Judging from the scene where we see Rorschach take of his mask for the first time in this series so far, we do learn he is a deeply disturbed individual, as he draws blood from his own head. The nightmare he has also ties him straight back to the events of the last issue of the original series. His demons seem to have driven him quite crazy, curious to see his relation to the original Rorschach Walter Kovacs. The reveal of The Mimes invisible weapons was a great, in the traditional ultra-violent style of Johns writing. This is a scene that would play out really well on screen. It is also obvious that Johnny Thunder will play an integral role in the series. He was teased all the way back in the Rebirth Special. You could feel his solitary sorrow, as he awaited his granddaughter's arrival with her son. Sadly we saw that not happen, but it was the detail in the movie scenes playing in the background that really made you ponder if it is foreshadowing of things to come. Some good teases to toward possibly the next issue, with The Mime and Marionette heading to find the Joker. Rorschach's incarceration at Arkham, Johnny Thunder's mental state (see Rebirth Special), Ozymandias after his fall and whatever else Dr Manhattan has been up to in the meantime. It was a little disappointing that we didn't get any more Superman since the first issue, but I do trust johns writing, and know that he will have a plan for big blue. Art - 5: Gary Frank's art is fabulous to behold, he is so meticulous with every panel, that it almost seems like watching a foreign movie. You seem so concentrated on reading the words, that you run the risk of missing seeing the "cinematography" of the page. This is comics at its best, a great writer with an equally great artist. As usual the panel work is amazing, it frames each scene beautifully and the flow of the visuals is without compare. At this stage, I would say that I personally find the art superior than the original series, but I may be biased, as I have been a fan of Frank's art for quite some time. One big surprise that really stood out to me was Batman's chest symbol. It had a yellow oval behind it. Granted it had a 3 dimensional quality to it, as it was raised from his chest, but this is something that Batman hasn't sported for about two decades now. They dropped it after the "No Man's Land" arc, and he has had the black bat on the chest ever since, (not counting the 5 minutes he sported one before the beginning of the N52). I personally thought it was a wonderful addition, as it reminds me of the late Silver and Bronze Age era. This was the look of the character that I was first introduced to, and Lord have I missed it so. Here's hoping that they adopt this look going forward. We saw the face behind the mask, for the new Rorschach (Reggie). As revealed in the first issue, he is African American, and though we may not know what his connection to the original Rorschach may be yet, he certainly looks crazy enough. The scene of him drawing blood from his head in the shower is a perfect example. One thing to note is that we still haven't seen Dr Manhattan in his full form yet. Aside from the flashback scene between him and Marionette last issue, we still haven't seen him in his full form while he has been in the DCU. I speculated that he may look like the New 52 version of Captain Atom now, or possibly have ties to that character, seeing as how he was based roughly on by Alan Moore. Along with that, we also saw that Dr Manhattan gave the smiley face button back to the Comedian, and if he has had it all this time, then what significance did the button that Batman found in the wall of the batcave, after Wally West appeared to him, which also lead to The Button storyline also? As I said before, Gary Frank manages to capture the feel of the original series without flaw, and nothing is more evident of that than the fight scene between Comedian and Ozymandias. It beautifully captures a feel from the original, but adds more detail and peril to it this time around. I felt at times the inks may be a little too heavy in some panels, but Frank manages to balance them out. The use of blacks (inks) compared to the negative space is perfect, and only makes me want to be able to read this book in black and white one day. I'm hoping that they do a Noir version of this in its collected form. The coloring has been top notch, with the modern coloring techniques very subtle, so it feels like it doesn't overpower the art, and has a vibe similar to the original series. The light glow from Rorschach's mask is a nice touch at Arkham, as are the grey tone panels for the indication of the movie scenes. All in all, a fabulous visual treat. 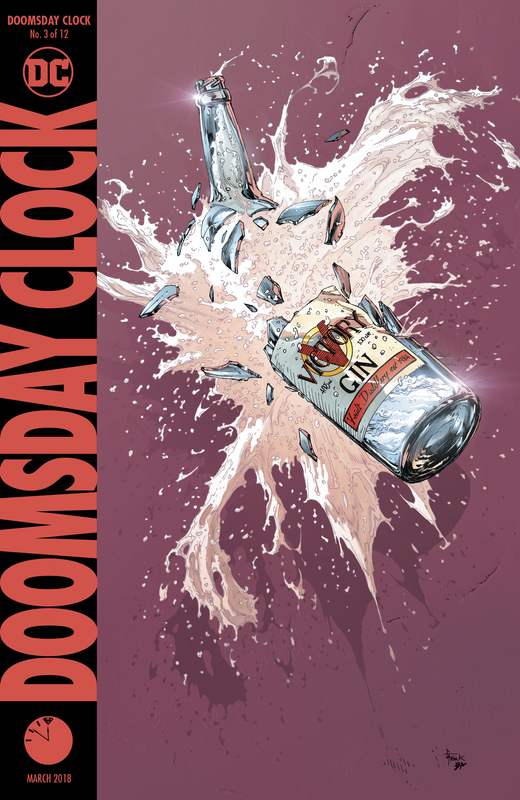 Cover Art - 3: Amazingly rendered by Gary Frank... But it's too obscure for my liking. I know that they are trying to copy the style of the original series, but it just doesn't grab my interest I'm afraid, hence the low grade. Variant Cover Art - 5: I like this cover a hell of a lot more, as it made more sense for the issue. It is beautifully drawn by Gary Frank again. 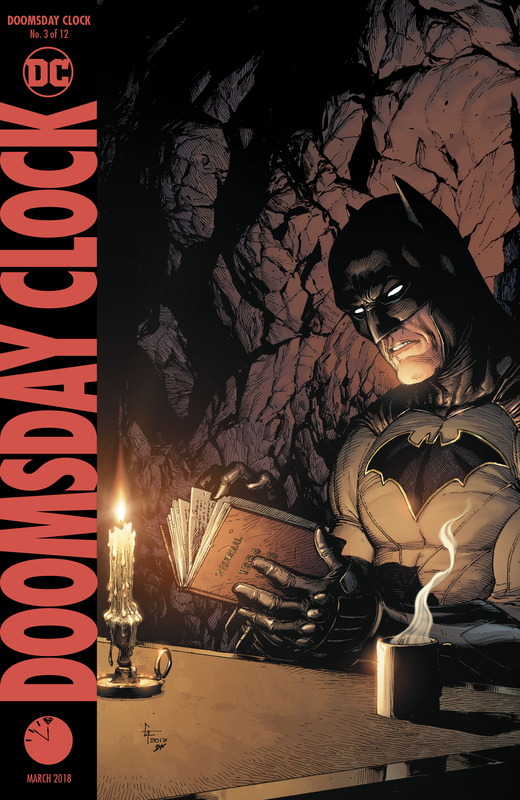 There is something intriguing about Batman reading Rorschach's journal. Notice the symbol on his chest, makes you wonder if they decided to change this for the interiors before the series was solicited.